Due to Backing and Glazing options involving custom cuts, these materials are not returnable or refundable under any circumstance. If there is ANY doubt as to the suitability of our Backing and Glazing for your application, we recommended that these materials be purchased from a local vendor. If the product arrives broken, please see the section titled, "Damaged or Defective Goods". Orders under than $79.00 are covered by our unconditional 7day return policy, EXCLUDING the purchase price of Backing and Glazing, as these items are not returnable or refundable (see above). If there is ANY doubt as to the suitability of our Backing and Glazing for your application, we recommended that you purchase these materials from a local vendor. To arrange for a return, simply contact us at quadroframes@gmail.com within 7 days of receipt of the order. The delivery date indicated on the package tracking information will be considered the date of receipt for the purposes of product return. Returned product must be in useable condition for a refund to be issued. Original (outgoing) shipping charges will be reimbursed. Return shipping charges are the responsibility of the customer. We recommend returning product via a traceable carrier, as the customer is liable for return shipping. Orders over $78.99 are not returnable. If there is any doubt on the suitability of our products, we recommend a small (less than $79.00), risk-free trial purchase. In exceptional circumstances, a return may be possible, but STRICTLY AT OUR DISCRETION. Under no circumstance will refunds be issued for Backing and Glazing options (see above). Any authorized return over $78.99 will be subject to a 25% re-stocking fee . Any authorized returned product must be in usable condition to receive credit. Outgoing and return shipping charges are NOT reimbursed. All orders ship from our facility located at 21 Valley St, Spencer, MA -01562 USA. We currently offer parcel shipping via Fedexground (1-5 business days within the Continental USA), Fedex Express, and USPS. Order Tracking information is automatically delivered to the e-mail address provided with your customer account. Tracking updates are sent directly by the shipper and are not updated in our shopping cart. Please ensure that e-mail from Fedex and USPS is not being intercepted by a spam filter to ensure delivery of tracking information. Multi-carton orders are consolidated to minimize shipping costs. Large orders ship LTL motor freight when appropriate. Please visit our Shipping Page for complete details on shipping, including transit times. Because orders often include fragile materials (glass etc. ), it is impossible to guarantee damage-free delivery. We will issue a full refund, including pro-rated shipping charges for all damaged or defective product reported within 7 days of delivery. If replacement of damaged or defective components is requested by the customer they will be provided at no charge but shipping charges will apply. CUSTOMERS ARE EXPECTED TO INSPECT ALL PACKAGES AND REPORT DAMAGE WITHIN 7 DAYS OF RECEIPT. PACKAGES MAY CONTAIN SHARP MATERIALS INCLUDING BROKEN GLASS AND MUST BE HANDLED WITH APPROPRIATE CARE TO AVOID INJURY. Damaged goods should NOT be discarded until we have been informed and we inform you that it is OK to discard the damaged product. We reserve the right to file a claim with shipping carrier, who reserves the right to inspect damaged goods. We manufacture most items offered on our website. We will beat any competitor's pricing on equivalent products of similar quality and quantity. Our guarantee applies to regularly stocked product lines and does not extend to closeouts, bankruptcies or other one-time offers. ONLINE ORDERS are processed on a Secure Web Site (SSL). Credit Cards are processed on the Authorize.net network for maximum security. Customers may also opt to use the Paypal processing network at their discretion. Payment terms include debit and credit cards. Accepted cards include Visa, Mastercard and Discover. American Express is accepted, but only over the Paypal processing network. We accept pre-payment via check or money order. However, orders will only ship after funds have successfully cleared. We DO NOT accept orders with COD. Purchase Orders are accepted with payment via credit card, debit card, or pre-paid check. We do not provide samples. 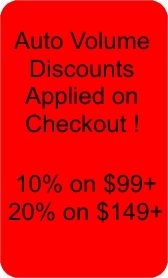 We offer a return guarantee on orders under $79 (see above), which allows a risk-free evaluation of our products. We do not print a physical catalog. All product information is available online. Do not hesitate to contact us if additional information is required. Business hours are 10:00 AM to 5:00 PM Eastern Time. Live phone support is available during these hours. Voice messages, emails and faxes are accepted at any time. Customer information is kept confidential. We do not sell or share mailing lists with 3rd parties.